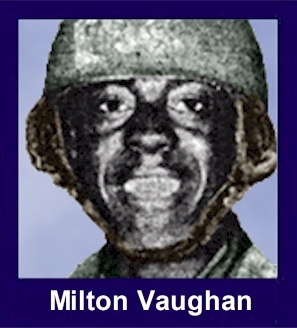 The 35th Infantry Regiment Association salutes our fallen brother, PFC Milton Lee Vaughan, who died in the service of his country on August 27th, 1966 in Pleiku Province, Vietnam. The cause of death was listed as Small Arms/AW (DOW). At the time of his death Milton was 21 years of age. He was from Portsmouth, Virginia. Milton is honored on the Vietnam Veterans Memorial at Panel 10E, Line 52. The decorations earned by PFC Milton Lee Vaughan include: the Combat Infantryman Badge, the Parachute Badge, the Purple Heart, the National Defense Service Medal, the Vietnam Service Medal, the Vietnam Campaign Medal and the Vietnam Cross of Gallantry with Palm Unit Citation. Milton was wounded July 7, 1966 and died of those wounds at Walter Reed. Milton is buried in the Roosevelt Memorial Park in Chesapeake, VA.
WITH THE 3RD BRIGADE, 25TH INF. DIV., Vietnam --- Dawn, less than half a mile from the Cambodian border. A 12-man squad is winding its way to home base through thick, dark jungle after spending a long restless night at Outpost Cord No. 4 watching for Viet Cong. Fifteen minutes from now, five of the 12 men will be wounded. Two will be near death. Moving along a creek bed, the men try to stay as quiet as possible. The squad leader, Sgt. John Smith, throws one hand up over his head. Everyone freezes. One, two, three seconds pass as Smith searches the mass of jungle to his left. Slowly, he raises three fingers, one by one, and whispers, "I've spotted three of 'em over there." The tense silence erupts as the Viet Cong open up with automatic weapons. We dive for the sand and scramble madly for a tree trunk near the creek. A soldier at the end of the trunk cries out as a slug tears into his chest. It doesn't take long to realize there are more than three. Many more! "You, you and you," Smith says. "Get across the creek before we're surrounded." By two's and three's the men splash across the creek, staying so low their chins nearly hit the water. The radio operator has made a frantic call to company base camp, telling them of our situation. The company is 2,000 meters from us across the same rugged, nearly impenetrable terrain. They are roughly 30 miles southwest of Pleiku. Running, stumbling, firing to the left and right and carrying the wounded man, gasping for breath, we look around us for any kind of cover. There is none, only elephant grass four feet high. Two men in front of you drop, partially hidden in the grass. You do the same. Fifty thoughts race through your mind as you hug the ground. If only you had a rifle, a pistol, a grenade--anything. It's not quiet now. You can't distinguish the sound of one bullet, or even a burst from a machine gun. It's all one terrible nightmare, sounding like a million rounds going off at once. "Hey . . . you . . . help me . . . " You look around. "Stars and Stripes . . . I'm hit . . . help me . . ." It's Smith. He's about five feet away. You start crawling to him. You don't really want to, but you do. What you really want to do is bury yourself as deeply as you can into the ground. "Smitty, where are you hit?" His eyes stare skyward, looking at something you hop never to see. He drops his hand from his chest. Blood spurts into the air. You find a bandage and tie it around him, telling him everything is going to be okay, thinking to yourself, wondering--will it? Ahead of Smith, PFC Milton Vaughan is slumped against a tree that same stare in his eyes. Gray matter is oozing out of the wound in his head. You find another bandage and cover the hole as he mumbles, "My God . . . My God . . . My God . . ."
All around you men seem to be shouting, yet trying to keep their voices at a muffled whisper. The Viet Cong now maybe 50 or 60, have you surrounded. They are screaming and yelling, hoping to panic the squad. It sounds like a Western movie with Indians whooping. But it's real. The air is filled with the smell of cordite, leaving a dense haze, engulfing the seven men still able to fire. PFC Gabriel Diaz, firing his M-60 machine gun into the grass, yells. 'They're right there. I can see the bastards. . . . They're right there, ten meters away.' The M-16 you found by Smith's side is ripping into the grass in front of you. There's nothing to see but grass and smoke. But they're there, ten meters away. The rifle stops firing. You find another clip and slam it into the gun. Viet Cong are screaming all around you. Suddenly it hits you. You're fighting for your life. The rifle jams. The jungle turns dead quiet. Everything you've ever heard about an M-16 rifle races through your mind. It won't fire. No matter what you do it won't fire. Another M-16 is laying close by. You grab it. Shove a fresh clip in and wait. The jungle explodes in another wild burst of fire, cries and smoke. You level the rifle and squeeze the trigger. Nothing happens--nothing. You drop the useless weapon and squirm closer to the ground. One thought races very clearly through your mind. "What in hell are you doing here?" "The map, I've got to have the map." It's Sgt. Richard C. Austin, who has taken command of the squad. "Where is it?" Austin says that Smith has it. You reach Smith again. "The map Smitty, we've gotta have the map." He's deep in shock. He says nothing. Without the map we haven't got a chance. The company, now on its way to us, has to know exactly where we are. You reach down Smith's bloodied chest and find the map. It's warm and sticky, covered with blood. You crawl back to Austin and give him the map. He talks into the radio, telling the company where we are. The area off to the right is wide open. You grab another rifle and make your way to the open spot. A deafening blast sends your face deeper into the ground. A grenade or mortar has landed where you had been only seconds before. Its white phosphorous. Little holes start smoldering on your back and legs from flesh-burns. You slap at the holes quickly, then turn and look back down the barrel of the M-16. Then, the 30 minutes that has taken a lifetime to pass, is over. C Co., 1st BN, 35th Inf., has spotted the squad. You can hear them talking and shouting orders. One of the first persons to reach us is SP5 Glenn R. Bowers, senior medic for Charlie Company. He bandages the wounded, tries to calm them, and calls for make-shift stretchers to be made from tree branches and ponchos. Forty-five minutes after Smith spotted the first three Viet Cong, he and the other four wounded are in a chopper, on their way to the field hospital in Pleiku. Capt. Alvino Cortez, C Co. Commander says his company has found four VC bodies, plus some ammo and automatic weapons. But there has to be more than that dead. You know there are. That was the morning of July 7th. That night, Austin, Diaz and the other five who survived the fight unwounded were back at Outpost Cord No. 4. They'll probably be there tonight, and every other night.